Europe, the USA and Canada are all popular winter holiday destinations when you’re talking about skiing and other winter sporting activities. And whether you choose to stay on this side of the ‘pond’ or take a trip across the Atlantic for your winter holiday, there are high quality ski resorts catering for all ages and abilities in all three locations and often it will simply be a matter of personal choice. However, there are a few subtle differences between a winter holiday in Europe and one in North America some of which are outlined below. You can’t do without snow on a winter skiing holiday and North American resorts are the envy of the world when it comes to high levels of guaranteed fresh, crisp powder making their ski seasons long and the skiing conditions top class. In spite of Americans generally being able to boast of having the ‘biggest’ of everything - when it comes to ski resorts, the opposite is very much the case compared to European ski resorts whose mountains are bigger, more rugged and more awe inspiring. The ‘vertical drop’ in the U.S. at most resorts is somewhere between 1500 and 2500 feet and even the likes of Jackson Hole and Big Sky which boast the largest vertical drops in the U.S. at just over 4000 feet come nowhere close to several resorts in Europe. The likes of Les Arcs in France and Davos in Switzerland can both claim vertical drops of more than 6,000 feet and even the relatively smaller St. Anton with its 4,400 drop still beats either of the USA’s ‘big two’. Families and groups in European resorts tend to adopt a more relaxed attitude towards their skiing and winter sports activities than the Americans or those from Canada. It tends to be more about enjoying each other’s company and shared experiences and having a good time in European resorts whereas in North America, there is much more emphasis on the sport itself and everybody pursuing their own individual goals and how many runs they can put in. This is also illustrated in the difference in attitude when it’s early morning. In European resorts, there is far much more of a ‘laissez-faire’ approach to getting up at the crack of dawn. For example, in the likes of Italy, Spain and France, most skiers only show up on the slopes around late morning whereas the longest queues of the day on the slopes of North America are often to be found before the ski lifts have even opened. This is where resorts in North America score far more highly than their European counterparts. In the US and Canada, people form orderly queues or ‘lines’ as they are referred to and everybody waits their turn whereas in some resorts in Europe, it can become a free for all and it’s not uncommon to encounter aggressive and pushy behaviour or to be in the midst of disorganised chaos. So, in general the North American experience tends to be a bit more civilised, courteous and orderly. This is extended to include the technical and mechanical side of things where in the US and Canada, lifts stay open, the pistes are bashed, signposts are a lot clearer and they ensure that there are enough places open for everybody to sit down to eat or get a snack. In other words, the North American resorts run like clockwork for the most part. Europe's resorts easily come out on top here. For many Europeans, the après-ski is as much part of the holiday as the skiing itself. Even during the day itself, the social element of the skiing in Europe is very much in evidence and as soon as the lifts close, the party often begins and can carry on well into the small hours. In fact, in many ski resorts in Europe, the discos and clubs are just about starting at midnight whereas in the US and Canada, midnight is around the time when most skiers retire to bed to get their rest in order to be up early to get back onto the slopes and do it all again the following day. 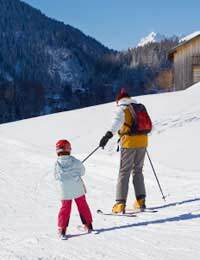 In general, therefore, it all depends what type of ski holiday you’re looking for. Most well travelled skiers however will tell you that they enjoy both experiences and that it depends on the type of holiday they’re looking at a particular time and who’s travelling with them for often citing the reasons above when it comes to the factors in making their choices for a particular winter holiday.